MAN-OF-THE-Match Eoin Larkin insisted that ‘we knew they weren’t dead’ after Kilkenny knocked out Tipperary in tonight’s heavyweight All-Ireland hurling qualifier clash. The reigning All-Ireland champions bounced back from last week’s loss to Dublin to keep their Liam McCarthy Cup dream alive for 2013. And in the process they knocked out their great rivals Tipperary with a 0-20 to 1-14 win in Nowlan Park. “We knew we weren’t dead,” Larkin told TV3 after the game. “People kept writing us off. As we proved over the years, there’s life left in the old dog yet.We weren’t happy with the way we played in the championship so far. We spoke a lot about it during the week and we knew there was a big performance in us. 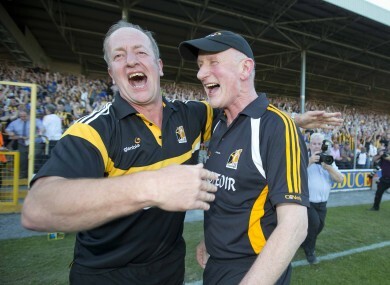 Kilkenny boss Brian Cody praised his team for having all the answers to the questions that were asked of them. “It was a consequence for losing for both teams tonight, you’re out of the championship the first week of July. They didn’t want that to happen, we didn’t want that to happen. So it was just fight for it. Super game, we’re just thrilled to be victorious. And Cody admitted it was ‘a huge lift’ for everyone in the Kilkenny camp when Henry Shefflin came off the bench after a long spell on the sidelines through injury. Henry’s back… but will he play tonight? Email “Kilkenny's Eoin Larkin: 'We knew we weren't dead'”. Feedback on “Kilkenny's Eoin Larkin: 'We knew we weren't dead'”.